A New Look for Our Front Door — Stevie Storck Design Co.
As an interior designer, I like to be experimental with my own home. When we first bought our house, I painted our front doors chartreuse, because I wanted a really bold and unexpected accent color to stand out from our white siding and black shutters. I really liked that look, but now that's it's been a few years I'm ready for something different. My personal style is always evolving but lately, I've been drawn to classic simplicity. And what's more timeless than a black door? Inspired by this color change, I've pulled together some classic front door decor inspiration - basically my wishlist for everything I want to do for our home! 1. Paint Color - For the black, I chose Sherwin Williams Caviar in Resilience Exterior Satin. One quart will be more than enough to paint a door! I love the richness of this shade of black, especially in the satin finish. 2. Tea Leaf Wreaths - We actually have two front doors, plus the kitchen door which is the one we mainly use. I love wreaths, but it's expensive to buy 3 for every season let alone storing that many! I have been looking for two simple, high quality wreaths I can leave up all year round on the front doors and I found the perfect ones from Silk Plants Direct. These are their 18" Tea Leaf Wreaths. They come in a pack of 2 and they are comparable in price to what I've seen at my local Target & Michaels stores but so much higher quality and more realistic. These are faux, not preserved so they will hold up better over time. I might add a bow at Christmas time, but regardless I think these work for every season. Now I can just change the wreath on the kitchen door out whenever I want to and it will be much more affordable since I won't be multiplying the cost times 3 every time. Silk Plants Direct has a ton of beautiful wreaths and faux florals to choose from. I reached out to them about a coupon code for you guys, and they are offering 10% off your order with the code BLOGGER10! 3. "Please Ring" Doorbell - I ordered two of these doorbells from Rejuvenation when they were on sale a few months ago. I got the antique brass, but they also come nickel, bronze and lacquered brass. Right now we just have a white doorbell on the white siding, so it's not very noticeable. In fact, I think my brother is the only one who ever rings our doorbell! Hopefully that will change once we get these installed. 4. 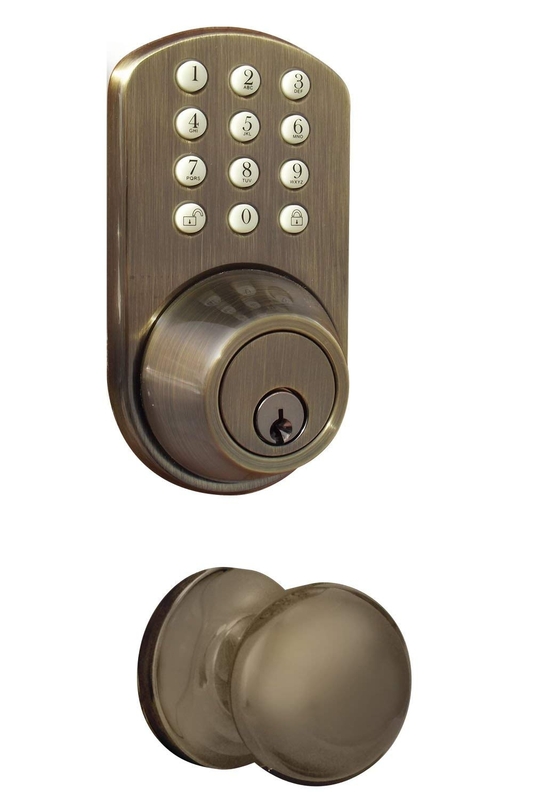 Door hardware - I've locked myself out too many times to count, so a keyless front door lock set is definitely in our future. I like that the finish of this one coordinates with the door bell and will pop off the black paint. Also, if you look closely the black numbers on the white buttons give a bit of a vintage vibe which I like. The convenience of modern technology with a look that fits out 1903 fixer upper - a win win! 5. Outdoor Wall Sconces - This is the outdoor version of the ceiling lights I chose for our hallways. I like the idea of bringing a little indoor/outdoor continuity to the house and the schoolhouse look of these Eddystone Wall Fixtures is so timeless. And seriously, at $20 a pop - you can't beat these! 6. Layered Door Mats - I think Studio McGee might be the mastermind behind the layered doormat trend and I love their Eucalyptus Bundle Doormat. It's a little pricey but the design is so gorgeous. I would layer it with this charcoal stripe indoor/outdoor rug in a 3' x 5'. 7. Faux Concrete Planter - Another thing I've been searching for are affordable urns for our front porch. These are cheaper than what I've seen at the garden centers and I like the warm, aged concrete finish. They also come in a browner color and a dark gray.